New Blog Site: Change your Bookmarks and RSS Feeders! Hi! So. After 5 years of having this blog on a free hosted site, I’ve finally taken the initiative to switch to my own site. If you’ve been accessing the site via thegastrognome.wordpress.com, please start doing so at TheGastroGnome.com. If you have it bookmarked, please change it! If you read this on a reader of some sort, please be sure to subscribe to the new site–if you go there, it will tell you how. In big letters. In reality, for the next year (at least) this site and all the links should forward directly to the new site, so hopefully this will all go seamlessly. If you have any troubles, please let me know! I look forward to continuing to update you on food and related thoughts at the new site. I was recently invited to enjoy a dinner courtesy of Foster Farms, a chicken company. I was apprehensive of the dinner beforehand, as I am of most any sponsored meal. The idea was to promote how local they are, but as a friend pointed out, McDonald’s also has a campaign about being local. Still, I arrived at the dinner with an open mind, ready to have my mind blown by chicken–whatever that could involve. When I say I eat locally, I want it to mean I support my community. Whether this means that my greens are grown in Carnation or it means that I’m supporting the immigrant couple that run the Ethiopian store down the street, I know that my money is staying here in Seattle. Maybe my lentils aren’t grown nearby, but the money I’m paying for them is paying for my neighborhood to remain diverse. Perhaps my bok choy comes from California, but the money I pay for it is going to pay to raise children here in Seattle. I may not know where my mango comes from, but I know that by eating locally that no company in Minnesota or Boston is hording my milk money. For me, this dinner was full of my community. 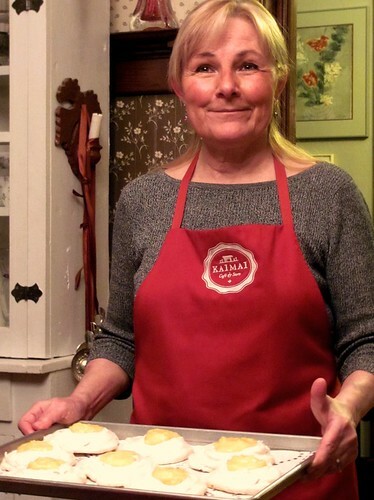 A community of food lovers, starting with this woman, Susan Neel of McCrea Cellars, who hosted the dinner. A cheerier, friendlier face you rarely did see. She cooked us five courses of chicken–the dessert is shown here: “Which came first?” These are pavlovas with lemon curd, a little trump l’oeil, made to look like an egg. She play the consummate dinner party chef, rushing into the kitchen, making sure everyone was happy and well fed, while her husband kept wine glasses filled. The meal ended (many hours and glasses of wine later) with a discussion of food, recipes, why we cook. Susan shared with us a treasured recipe from a Vietnamese shopkeeper, which had been scrawled on the back of a piece of a Pall Mall cigarette box. So at the end of this dinner, where I sat at a table with friends I had spoken to only online, a woman who made me cry the first time I spoke with her, and complete strangers who had invited me in their home, I knew that I wanted to support a company that supported this community. Yes, I do want to know more about their farms before I tell anyone to rush out and buy their chicken. Yes, I’d like to do a farm tour a la the one Shepherd’s Grain took me on before I say too much in favor of their company and its practices. Yes, I’d rather I know my chicken was named Colin and he had nice friends (watch the clip above if you don’t get this). But they’ve started the process of getting me on board. There are very few brands I am passionate enough about to devote a blog post to, and even fewer that, upon receiving an email about saving, I will hop out of bed and compose a blog post about at 6:45 in the morning. The cheese from Estrella Family, however, does inspire such things. Estrella Family Creamery makes my favorite cheese(s) in the world. As many of you know, the FDA is working hard to shut Estrella Family Creamery down and they have been unable to sell their cheese for quite some time. This is tragic, not only because I have to live without the incomparable Caldwell Crik Chevrette, but because it is indicative of what government agencies are attempting to do to great cheese-makers around the country. Washington has already lost too many great cheeses to ridiculous regulations, and I refuse to let the best cheese I’ve ever had go down to government regulations to. So people, I implore you, please help me and help Estrella to SAVE THE CHEESE! How? Well, funny you should ask. First and most, attend their Small Farms: Saving our National Treasures event on February 26th, from 11-4, in Woodinville. For more info, click here. This is a free event, with raffles and auctions to support the farm, as well as speakers leading a discussion in the hopes to solve the issues plaguing Estrella and so many other farms. If you aren’t local, I still hope that at some point you’ve been able to taste Estrella’s magical cheese, and if so (or not) and you’d like to help, Donations to aid the Estrella family can be made at Pledgie.com. Donations are not tax-deductible for federal or state tax purposes. If you’d like more information about Estrella and what has happened with them, see this blog, set up by a friend of theirs. The cocktail thought has been coming for a while. Drinking and eating go hand in hand and when I’m doing one, I’m often doing the other, so a blog about what I eat has seemed incomplete without also discussing what I drink. As I’ve thought more about what I’m drinking, I’ve spent more time creating cocktails. The longans, a small southeast Asian fruit somewhat similar to a lychee, came to be because they are incredibly delicious. So delicious that I had picked up a ten dollar net bag of them and am currently rushing to get through them for fear they will rot before I do. Nothing this delicious deserves to go bad. That said, there’s a lot of them still to go through and they’re somewhat time consuming to take apart in order to eat. Or drink. To get to the sweet, complicated flavor of the longan’s meat, one must first peel away the skin, a thin but tough layer, requiring piercing with something preferably better than your fingernail. I broke a nail using my fingernail to do it. The skin will peel away fairly easily after that, as it is not really attached to fruit itself. Once you’re done with that however, you must remove the small, smooth pit from the center, which is partially attached to the fruit. If you’re popping them in your mouth, it is easiest to just eat them whole and spit the pits out. When using them in cocktails, these too must be removed before starting the drink. For each of our drinks we muddled a handful of longans with the alcohol, usually about 5 of them. The house favorite was actually the first drink we made, the one pictured above, though all three were fairly delicious and I would (and will) make them again! Muddle the longans with a 1.5 oz of cahcaca and strain into a glass, over ice. Top it off with an equal amount of ginger ale, garnish with another longan and you’re all set. Muddle the longans with 2 ounces of the whiskey, adding a splash of the grenadine and a dash of the bitters. Strain and serve up. Sorry. I tried to resist making up stupid names for them for as long as possible. I love stupid names though. This cocktail was also the most surprising and complex, so I’m a little proud of it. In this drink, we muddled the longans with the gin and vermouth, poured it over crushed ice and then added a very heavy handed dash of bitters. What other drinks would be good with longans? What other strange fruits or other items would be good in drinks? If anyone else grew up in a household with two brothers and only basic cable, you too have probably seen Coming to America over a thousand times and when the New York City borough of Queens is mentioned, this line is all that you can think of. No? Just me? Again? Alright, this is enough already. Seriously though, we did a food excavation of Queens on our most recent trip to New York. We had overlooked the boroughs on our last trip, and it was a hole in my eating repertoire that I was ready to fill. Fill I did, with Liberian stew, Egyptian offal and three separate trips to Flushing Chinatown. For regular readers of my blog this will not be surprising. I am a little late with this post, but I wanted to report back the best of my findings. As has already been discussed in numerous places on this blog, I’m a bit of a sucker for Anthony Bourdain. I am a wee bit embarrassed by it, however it has also lead me to more than one good meal. This is one of those good meals. As has already been discussed in numerous places in the blogosphere, there are downsides to Kabab Cafe. It can be expensive. There is no menu. The dude is crazy. It’s small. They serve weird food. All of these are right. If these are things that will turn you away from a restaurant, I do not recommend Kabab Cafe. If you’re like me, though, and bit parts of big animals served by a mad scientist from a kitchen the size of a gas station bathroom turns you on, this is the place for you. A big portion of my enjoyment of the place was watching the owner/chef, Ali work. Not the part when he laid into his poor assistant (a thankless job, it appeared). Rather his flicking of spices this way and that, the clatter of pans and disorganized tossing of ingredients which all made their way to my plate, turning out as great dishes. I was taken aback upon walking in, where I was gruffly asked, nay, barked at, what I wanted to eat. I didn’t know, so I was given the option of meat or veg. I caught up to the moment and mentioned I was here for dead animal–the good parts. 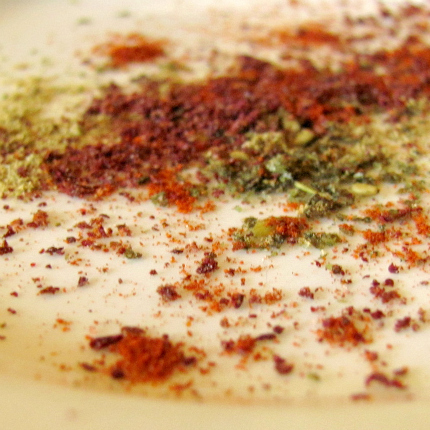 We were seated and given plates (shown above) of spice along with bread and hummus for dipping. Then the good stuff started coming out. First was a rich sauce of braised cheeks and hearts over lightly scrambled eggs. I use ‘over’ loosely as it was sort of an un-pretty pile of reddish lump on my plate. That said, it tasted great. None of the dishes were overly photogenic, and in fact the next three looked so alike it took in depth analysis to remember which was what. Second up, though was sweetbreads. This was the most traditional of the dishes, followed by the brains, which were a favorite of mine–these pan-fried ones were significantly better than the steamed version I’d had in Laos. Finally we had to cry uncle after a plate of kidneys–we were too full to see what the mad scientist would bring us next. The total for this, 4 smallish plates with bread and snacks plus a few drinks was around $80 in the end. Not cheap. Be prepared for this if you go. But do go if you love great meat in interesting preparations. I thought the food was delicious and the setting unique and that it was worth every penny. When I first read about Maima’s it was about Liberian food and that it seemed similar to Ghanaian, a favorite of mine. I stored it in the back of my head. Then it popped up again–winning an award for being one of the spiciest foods in NYC. Again, a favorite food of mine (anything spicy). It had to be done. Had to, despite being a little out of the way and in a neighborhood that us two were so out of place in that we got asked twice in the block between the car and the restaurant if we were lost. By the cops. We were impressed-taking preventative measures or being helpful? Unclear. Once in the restaurant we would have been out of place, had there been anyone else there. We ordered seafood soup (pictured) and chicken stew. 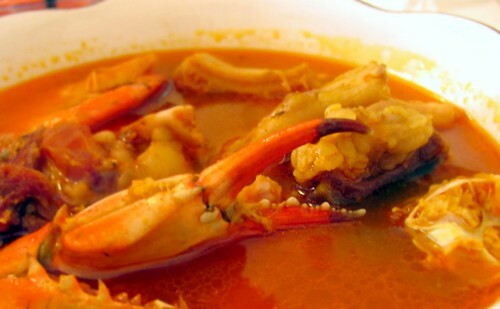 Aside from containing nearly an entire crab, multiple prawns, clams and a good chunk of fish, the soup had tripe, chicken feet and a pork…knuckle? I was impressed at the array of stuff in it, as a sopped it up with fufu, the thick starch it was served with. It was spicy in the best kind of way, a slow burn that works its way into every part of your mouth, including the outside, leaving you with fruit punch lips akin to that kid in elementary school. The chicken was less spicy, but possibly even more flavorful–the underlying richness in these foods, the warmth and flavor that is cooked into them really sets them apart. A pair of gentleman in cable company uniforms sat at one of the other tables. They held their giggles at our tears of pain and joy regarding the spice level and asked us if we were enjoying it. We were. They were from Liberia, they told us, and loved the food at Maima’s. It was just like what their mama would make in Africa. If that is not what an immigrant cuisine restaurant can strive for, I’m not sure what is. All I know is that I’d like to borrow a Liberian mama (Maima?) to start a restaurant in Seattle. 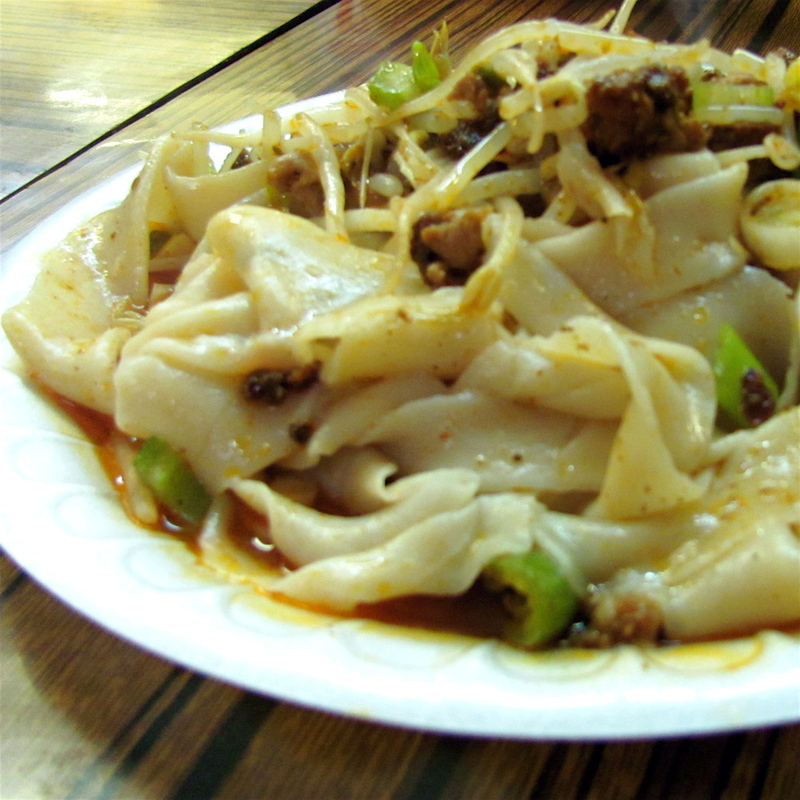 Xi’an Fine Foods is no news to people in New York. I’d like to hope that anyone who truly loves great food wouldn’t find it news either. The shop we went to is in the basement of the Flushing Mall (Mall being a loosely used term). Zigging and zagging through a maze of deliciousness, we got distracted by a dumpling here, a soup there, before we got to this stand. Lamb hand pulled noodles were the only thing on my mind. Until I looked at the menu, then I wanted everything. But I was there for the noodles, and I’d found to many distractions on my way in to afford more stomach room. Those noodles? the most friendly little texture a noodle ever did have. Filling my mouth with big thick noodle, then chewing apart with the lightest of toothy touches. The flavor stood up to the texture, spicy, savory, that combination of middle-eastern cumin edge with bright, popping Chinese cooking techniques. This is the noodle dish that (my) dreams are made of. We actually ended up going here twice by accident. That was a very happy accident. Disappointed that New Yeah Shanghai House, our favorite soup dumplings, or XLB, seemed to have closed, we had researched what the next best might be and come up with Nan Xiang. We went, just the two of us, and really enjoyed them. I didn’t think they were as good as New Yeah, but I did like it better than those from Joe’s Shanghai and a number of others in New York. A few days later we were headed back to Flushing Chinatown with my friend T., a Flushing native–in fact, her dad owns a restaurant in the area, which has sadly been closed every time I’ve been in town! I’ve had his food though–me, her fathers lobster sauce and a 5 hour drive. It was not pretty. Right, back to Nan Xiang. T. was excited to bring us to her favorite XLB spot in the hood, which was, of course…Nan Xiang. She felt bad that we had already been, but us, having been already, were not complaining. The food was again great, this time we were able to branch out and try a few more things. I wasn’t a fan of their other dumplings, but the noodles and the rice cake dishes were both excellent. 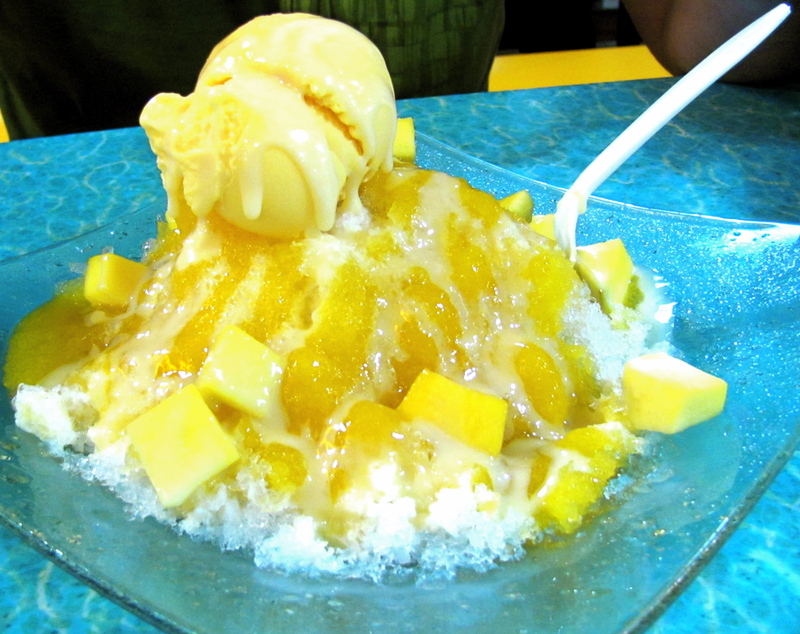 It was almost 100 degrees out and this was mango flavored frozen awesome from a basement of a mall behind Nan Xiang. Whistler is like a second home for me, I grew up flying down its slopes and was raised on the what little great food was available there in 1989. Not to sound too much like an old-timer, but when people ask me for a restaurant recommendation in Whistler, both the places I suggest have been open since the mid-80s, Sushi Village and the Rimrock. Now I have a third suggestion. Though I’ve been there a tiny fraction (okay, the once) of the times I’ve been to the others, I’m inspired and hopeful about the ambitious, innovative and yet totally fitting menu that Aura, at the new and already under new management restaurant at the Nita Lake Lodge. Like so many restaurants, Aura had an off-season prix-fixe menu that was a great value. We ended up there because my father had been previously for cocktails and snacks on the porch and was impressed, meanwhile the Rimrock was closed for a private party and the Bearfoot Bistro (another place I’d heard good things about and is not affordable in-season) couldn’t be bothered to answer their phone. I mentioned on Twitter that we would be checking out Aura, and the restaurant wrote back, excited. I mention this only because some of the treatment we got is (most likely) not normal. After talking with the manager I learned that he and the chef had previously worked together at the famed Wickaninnish Inn in Tofino. It made sense that the adventurous yet locally focused food had a history in Tofino, as between the Wick Inn and Sooke Harbour House, that’s what the town is building a name around. 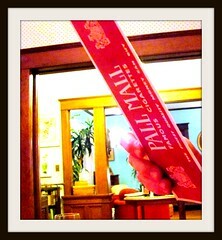 You can see for yourself that the menu is ambitious and creative. While I was sad that they didn’t have the chicken oysters in savory oatmeal while I was there, I enjoyed my appetizer which was the a duck confit agnolotti afloat in a mushroom broth so rich that Robin Hood would have been eying it. The pasta on the agnolotti was rolled thicker than ideal, but it held up to the broth because of this, and once opened, the soup was further enhanced by the meat. My dad had a seafood ceviche trio that was fresh and bright, accompanied by angostura bitters foam (mandatory eye roll for foam), compressed watermelon (hitting food trend nail on head) and my favorite part, the granulated local honey. The sweet of the honey and fruit matched up well with the seafood, but it was the texture of the granulated honey that I thought made the dish, that little bit of crunchy sweetness with the soft seafood. After our appetizers and our ridiculously cheaply priced and good cocktails, the chef came out to say hello. He mentioned that he was doing all his charcuterie in house. I know that my face lit up. I love cured meat like a fat kid loves…well, cured meat. He very kindly brought us a charcuterie sampler which was accompanied by a lovely fruit beer (not my usual style, but it paired perfectly). My favorite from the platter was the veal cheek pastrami, though the pickled tongue was also delicious. As part of the off-season, prix-fixe, $41, 3 course menu (in season, the chef told us, there would be more options, but it would be more expensive), we got the previously mentioned appetizers, as well as mains and a dessert. The amuse bouche was a nice touch, though not overly memorable. For our mains, my dad’s tongue twister of a dish was charred arctic char with swiss chard (hardy har har). A perfectly cooked piece of fish with lovely accompaniments but my braised veal with buttermilk spaetzle was unbelievably good. My dad refused to believe that such flavor came from simply grilled and braised meat could be so good and was asking for what spices were used. I just continued to fork off pieces of meat. Did I mention the amount of meat on this dish could have fed a family of four? We finished up with dessert–or in my case a cheese plate of local varieties, which was nice, as I had never tried any of them before. Overall, the meal was an incredible deal and while I will definitely be back for the prix-fixe menu for as long as it remains such a good value (three courses including an entree big enough for leftovers for $41). Most of all, though, the $7-10 cocktails and the charcuterie plate really stood out for me, which means I think I know where I’m going drinking next time I’m up in Whistler. As is often the case with ambitious chefs, I worry that the crowd willing to put down the cash for the food will be too stodgy for the creativity it offers and that by the time I return in the next off-season for a second helping, the chef will have been stifled. All I can do for now is keep my fingers crossed and plan my next meal. Somehow, somewhere I got the idea that I needed to make a Peking Turkey for Thanksgiving this year. It was extravagant, cross-cultural, a project. It was perfect. Most people just looked at me sideways as I excitedly described my plan. I even found evidence that someone had done it before and was able to use their recipe to guide me. My parents left town for Thanksgiving, and left to my own devices, I took over their kitchen (nicer than mine–and there’s a dishwasher), and created a feast with my friends. I was also lucky enough to have the amazing Valentina at Thanksgiving dinner, so she is responsible for the incredible photos of the meal. 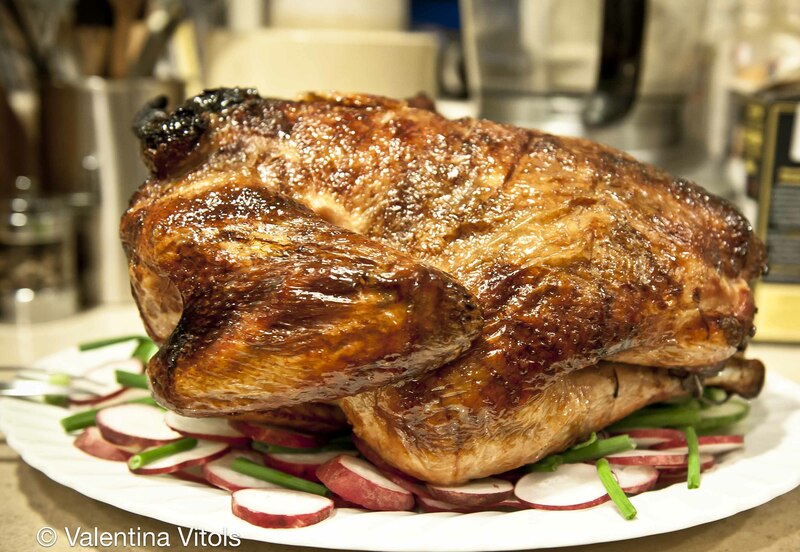 We set the turkey on a bed of sliced radishes and scallions, and sliced it in traditional Peking duck style, with the skin separated from the meat. Coming from a girl not really enthralled by traditional roast turkey, this was my personal favorite preparation of turkey. It took a little bit of work, but not much more than a brined bird–about 20 minutes the day before and two hours plus prep and resting time on the day of. 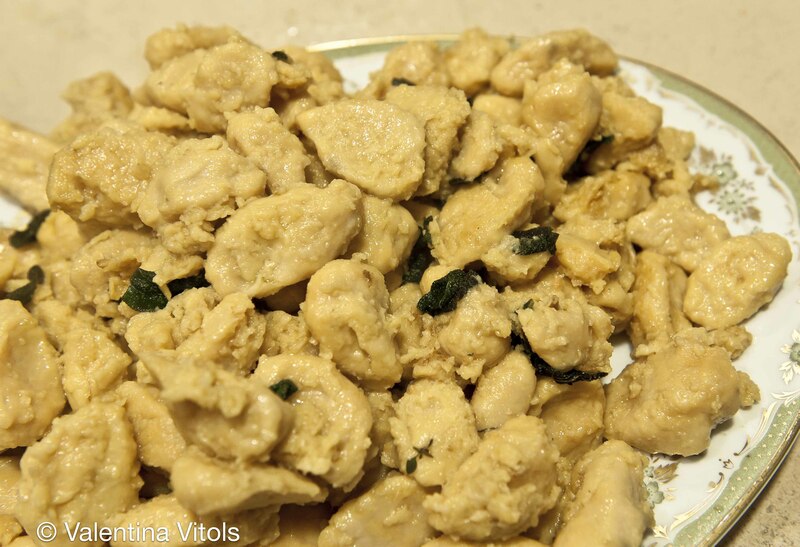 This is my sweet potato gnocchi, from an old recipe, sauteed with sage. I’m a sucker for dough-based items, so this was a great alternative to traditional mashed or baked sweet potatoes. K and T brought these super easy and quick appetizers. So easy that since the kitchen was in such heavy use, K was able to prepare these while sitting on the floor with a cookie sheet! 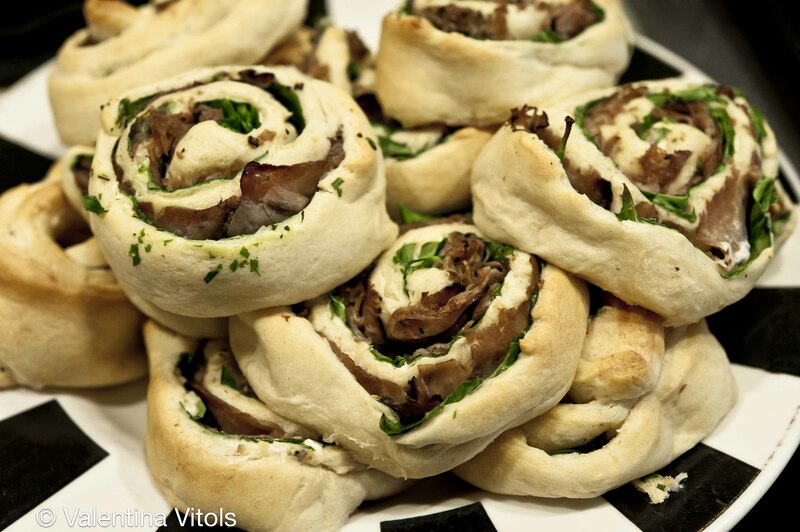 Just unroll a sheet of Pilsbury crescent dough, spread with cream cheese, top with a a layer of roast beef and a little arugula. Roll up, slice and bake. Not my usual route, but they were delicious and I could definitely see doing riffs on this with herbs and horseradish for extra zing. They were a huge hit. “These would be even better, if only we had a little bacon” Someone said. Perhaps it was R, Valentina’s husband, as she crafted these little arepitas, mini Venezuelan corn pockets. Bacon was procured (We had to add it to butter for the oyster stuffing, if I’m honest). 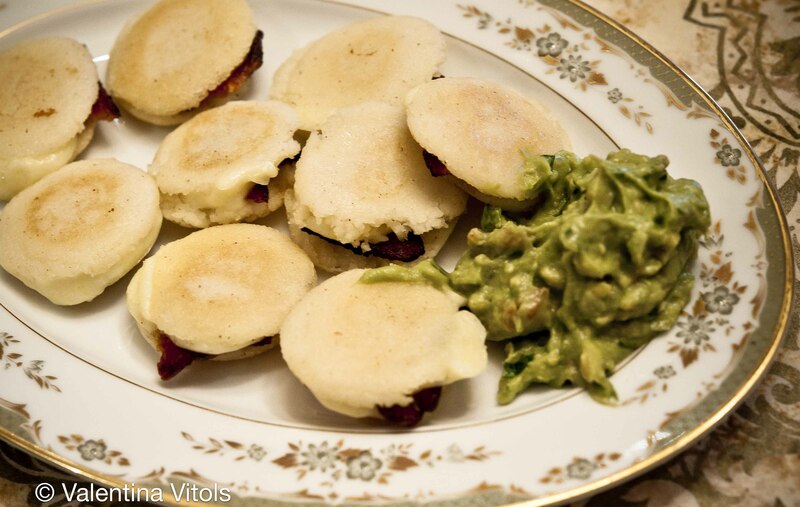 Arepitas were stuffed–Beecher’s cheese curds and bacon–and then consumed. I’m impressed that Valentina managed to snap a photo, but she’s good like that. It wasn’t a traditional Thanksgiving by any means, but it was a delicious one, with good friends, good wine and great food.